Will Sadr’s Rising Star Eclipse Bush’s Surge? Public opinion polls are valuable chips to play for those engaged in a debate of national or international consequence. In the end, however, they are abstract numbers. It is popular demonstrations which make them truly meaningful by giving them substance, color, and, above all, wide media exposure. This is particularly true when such marches are peaceful and disciplined in a war-ravaged country like Iraq. The demonstrators arrived from all over the country in response to a call by Muqtada al-Sadr, a radical Shiite cleric, to demand an end to foreign occupation on the fourth anniversary of the end of Baathist rule in Baghdad. The presence of many senior Sunni clerics at the head of the march, which started from Sadr’s mosque in nearby Kufa, and the absence of any sectarian flags or images in the parade underlined the ecumenical nature of the protest. Crucially, the mammoth demonstration reflected the view prevalent among Iraqi lawmakers. Last autumn, 170 of the 275 members of Parliament signed a motion, demanding to know the date of a future American withdrawal. The discomfited government of Prime Minister Nouri al-Maliki played a procedural trick by referring the subject to a parliamentary committee, thereby buying time. Opinion polls conducted since then show three-quarters of Iraqi respondents demanding the withdrawal of the Anglo-American troops within six to twelve months. Though in his early thirties and only a hojatalislam (“proof of Islam”) -- one rank below an ayatollah in the Shiite religious hierarchy -- Muqtada al-Sadr has pursued a political strategy no other Iraqi politician can match. The sources of his ever-expanding appeal are his: pedigree, fierce nationalism, shrewd sense of when to confront the occupying power and when to lie low, and adherence to the hierarchical order of the Shiite sect, topped by a grand ayatollah, at present 73-year-old Ali Sistani, whose opinion or decree must be accepted by all those below him (for his part, Sistani does not criticize any Shiite leader). Muqtada’s father, Grand Ayatollah Muhammad Sadiq al-Sadr, and two elder brothers were assassinated outside a mosque in Najaf in February 1999 by the henchmen of President Saddam Hussein. The Grand Ayatollah had defied Saddam by issuing a religious decree calling on Shiites to attend Friday prayers in mosques. 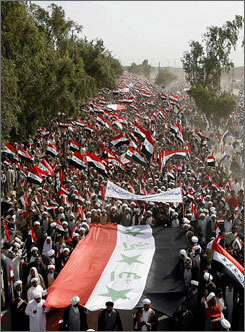 The Iraqi dictator, paranoid about large Shiite gatherings, feared these would suddenly turn violently anti-regime. Muqtada then went underground, just as he did recently in the face of the Bush administration’s “surge” plan, resurfacing only after the Baathist regime fell in April 2003. Saddam City, the vast slum of Baghdad, with nearly 2 million Shiite residents, was renamed Sadr City. As the surviving son of the martyred family of a grand ayatollah, most Shiites lauded Muqtada. While welcoming the demise of the Baathist regime, Sadr consistently opposed the continuing occupation of his country by Anglo-American forces. When Paul Bremer, the American viceroy in Iraq, banned his magazine Al Hawza al Natiqa (“The Vocal Seminary”) in April 2004 and American soldiers fired on his followers protesting peacefully against the publication’s closure, Sadr called for “armed resistance” against the occupiers. Uprisings spread from Sadr City to the southern Iraqi holy cities of Najaf and Karbala, as well as four other cities to the south. More than 540 civilians died in the resulting battles and skirmishes. Since the American forces were then also battling Sunni insurgents in Falluja, Bremer let the ban on the magazine lapse and dropped his plan to arrest Sadr. Later, Sadr fell in line with the wishes of Grand Ayatollah Ali Sistani to see all Shiite religious groups gather under one umbrella to contest the upcoming parliamentary election. His faction allied with two other Shiite religious parties -- the Supreme Council for the Islamic Revolution in Iraq (SCIRI) and Al Daawa al Islamiya (the Islamic Call) -- to form the United Iraqi Alliance (UIA). Through his actions in the face of American hostility, Sadr gave protective political cover to his faction and its armed wing, the Mahdi Army (U.S. officials in Baghdad and Washington have long viewed Sadr and his militia as the greatest threat to American interests in Iraq). Of the 38 ministers in Maliki’s cabinet, six belong to the Sadrist group. When the Pentagon mounted its latest security plan for Baghdad on February 13, aiming to crush both the Sunni insurgents and Shiite militias, Sadr considered discretion the better part of valor. He ordered his Mahdi militiamen to get off the streets and hide their weapons. For the moment, they were not to resist American forays into Shiite neighborhoods. He then went incommunicado. Muqtada’s decision to avoid bloodshed won plaudits not only from Iraqi politicians, but also, discreetly, from Sistani, who decries violence and whose commitment to bringing about the end of the foreign occupation of Iraq is as strong as Sadr’s, albeit not as vocal. In a message to the nation, on the eve of the fourth anniversary of the demise of Saddam’s Baathist regime, Sadr coupled his order to the Mahdi fighters to intensify their campaign to expel the Anglo-American troops with a call to the Iraqi security forces to join the struggle to defeat “the arch enemy -- America.” He urged them to cease targeting Iraqis and direct their anger at the occupiers. It was the Mahdi Army -- controlling the shrine of Imam Ali, the founder of Shiite Islam, in the holy city of Najaf -- that battled the American troops to a standstill in August 2004. The impasse lasted a fortnight, during which large parts of Najaf’s old city were reduced to rubble, with the government of the U.S.-appointed Prime Minister Iyad Allawi, favorite Iraqi exile of the CIA and the State Department as well as leader of the exiled Iraqi National Accord, failing to defuse it. By contrast, it took Sistani -- freshly back in Najaf, his home base, from London after eye surgery -- a single session with Sadr over dinner to resolve the crisis. A compromise emerged. The Mahdi army ceded control of the holy shrine not to the Americans or their Iraqi cohorts, but to Sistani’s representatives, and both Mahdi militiamen and U.S. troops left the city. Ali Sistani established his nationalist credentials early on. As the invading American forces neared Najaf on March 25, 2003, he issued a religious decree requiring all Muslims to resist the invading “infidel” troops. Once the Anglo-American forces occupied Iraq, he adamantly refused to meet American or British officials or their emissaries and continues to do so to this day. In January 2004, when Washington favored appointing a hand-picked body of Iraqis, guided by American experts, to draft the Iraqi constitution along secular, democratic, and capitalist lines, Sistani decided to act. He called on the faithful to demonstrate for an elected Parliament, which would then be charged with drafting the constitution. And he succeeded. When Allawi began dithering about holding the vote for an interim parliament by January 2005, as stipulated by United Nations Security Council Resolution 1546, Sistani warned that he would call for popular non-cooperation with the occupying powers if it was not held on time. In the elections that followed, the United Iraqi Alliance, the brain-child of Sistani, emerged as the majority group, and thus the leading designer of the new constitution. Respecting Sistani’s views, the Iraqi constitution stipulated that Sharia (“Islamic law”) was to be the principal source of Iraqi legislation and that no law would be passed that violated the undisputed tenets of Islam. In the December 2005 parliamentary general election under the new constitution, the UIA became the largest group, a mere 10 seats short of a majority. Though Ibrahim Jaafari of Al Daawa won the contest for UIA leadership by one vote, he was rejected as prime minister by the Kurdish parties, who held the parliament’s swing votes, as well as by Washington and London. A crisis paralyzed the government. Once again, Sistani’s intercession defused a crisis. He persuaded Jaafari to step down. Jaafari’s successor, Maliki, is as reverential toward Sistani as other Shiite leaders. For instance, in December 2006, when American officials reportedly urged Maliki to postpone Saddam Hussein’s execution until after the religious holiday of Eid Al Adha (“the Festival of Sacrifice”), Maliki turned to Sistani. The Grand Ayatollah favored an immediate execution. And so it came to pass. Sistani’s next blow fell on the Bush administration earlier this month. He made public his disapproval of Washington-backed legislation allowing thousands of former Baath Party members to resume their public service positions. This undermined one of the White House’s pet projects in Iraq -- an attempt to entice into the political mainstream part of the alienated Sunni minority that is at the heart of the Iraqi insurgency. In sum, while refraining from participating in everyday politics, Sistani intervenes on the issues of paramount importance to the Iraqi people, as he sees them. Western journalists, who routinely describe him as belonging to the “quietist school” of Shiite Islam (at odds with the “interventionist school”), are therefore off the mark. Given Sistani’s uncompromising opposition to the presence of foreign troops in Iraq, his staunch nationalism, and the unmatched reverence that he evokes, particularly among the majority Shiites, he poses a greater long-term threat to Washington’s interests in Iraq than Muqtada al-Sadr; and, far from belonging to opposite schools of Shiite Islam, Sadr and Sistani, both staunch nationalists, complement each other, much to the puzzled frustration of the Bush White House. What must worry Washington more than the massive size of the demonstration on April 9th was its mixed Shiite-Sunni composition and nationalistic ambience. The prospect of Sadr’s appeal extending to a section of the Sunni community, with the tacit support of Sistani, is the nightmare scenario that the Bush administration most dreads. Yet it may come to pass. Dilip Hiro is the author of Secrets and Lies: "Operation Iraqi Freedom" and After and, most recently, Blood of the Earth: The Battle for the World’s Vanishing Oil Resources. Copyright 2007 Dilip Hiro. Reprinted courtesy of TomDispatch.